While I was in high school and college, I ran my parents’ farm stand during the summer months. We sold tomatoes, peaches, melons, but most of all, we were known for having the best sweet corn. Sometimes I would wake up at dawn to pick corn with my Dad. We would drive out to the field and work our way down row after row of dewy corn stalks, stuffing rough burlap bags full of bi-colored sweet corn. I can’t eat enough corn this time of year. I like bi-colored, yellow and white, corn the best, but the most important factor is freshness. As soon as it’s picked, the sugars begin turning to starch. Old timers used to start the water boiling before heading out to the field to pick sweet corn, thinking every second mattered. But genetic tinkering has created sweet corn that tastes sweeter longer. Now freshness can be measured in hours and days instead of minutes—I always like to make sure I’m eating corn that was picked within the last day or two. I usually just boil corn-on-the-cob for 4 minutes and eat it with a little butter, salt and pepper—beautiful and simple. But here I combined my love of corn with my obsession with Saturday morning pancakes. I’ve made these without the fresh corn added, and they were good. With the fresh corn, they’re great. 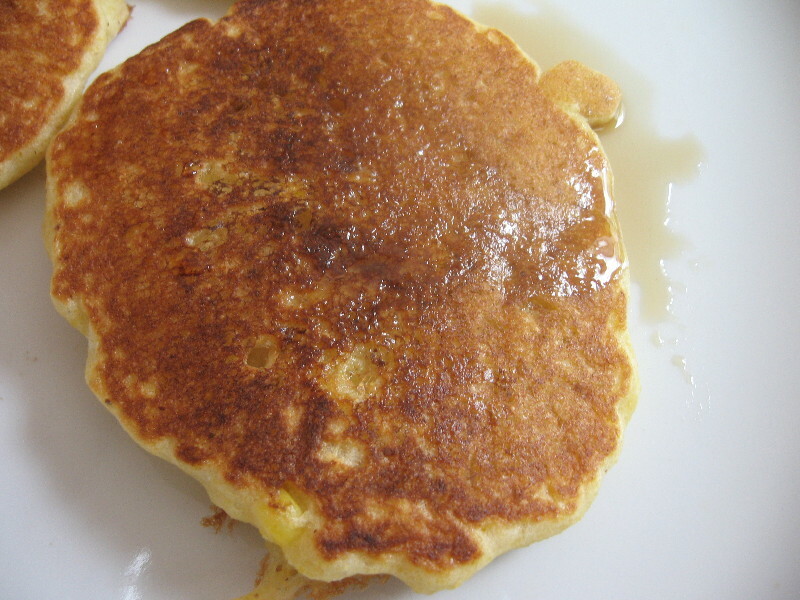 The recipe, of course, is from The Pancake Handbook, my favorite pancake resource. In a small saucepan bring the water and butter to a boil. Combine cornmeal, salt and sugar in a large bowl, and pour the boiling water and butter over. Stir to combine and cover the bowl with plastic wrap or a clean towel. Let rest about 10 minutes, until liquid is absorbed. Beat eggs and milk in a separate bowl, then lightly mix in the flour and baking powder. Add the egg mixture and fresh sweet corn to the cornmeal, stirring gently just to combine. The batter will be thick and a little lumpy. Heat a griddle or skillet over medium high heat (375 degrees for electric griddle). Poor 1/4 cup batter onto the griddle, cooking for 2 to 3 minutes, until bubbles form on the pancake surface and the underside is golden brown. 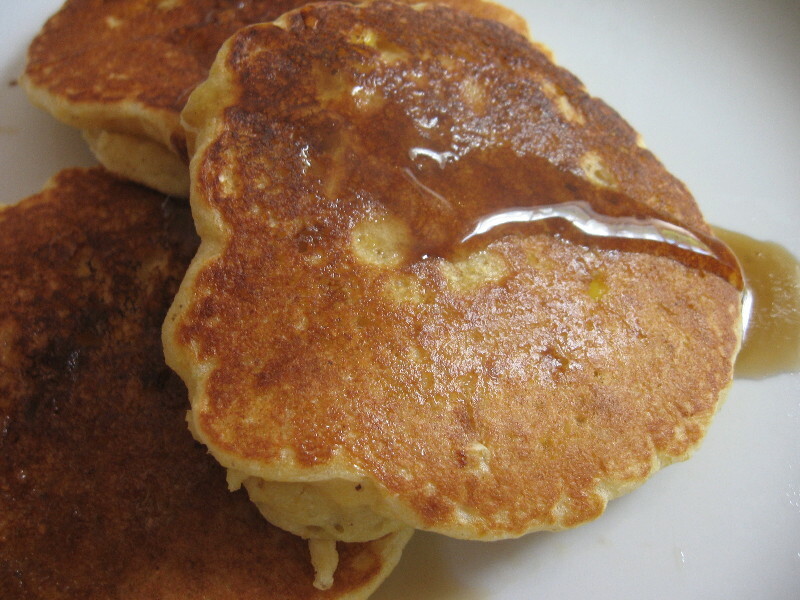 Serve with butter and maple syrup.